For years indigenous people living in small villages along Alaska’s Arctic coast fiercely fought offshore drilling. Now they want a piece of the action. When Shell first showed up in 2007 with a fleet of drillships and support vessels, and parked them in the migration path of the bowhead whale in the eastern Alaska Beaufort Sea, the Inupiats went to court. An injunction from the US Ninth Circuit stopped the company and started a chain of problems that would ultimately defeat Shell’s multibillion dollar Arctic initiative. Fast-forward to 2018. The Inupiats have now taken over Shell’s offshore Beaufort Sea leases, where there were also earlier oil discoveries, and intend to develop them, most likely by partnering with larger firms. In a decade, indigenous people in northern Alaska have come full circle, from hostility to cautious embrace of offshore drilling. Arctic Slope Regional Corporation, owned by all Inupiats of the North Slope, is playing its cards close on its plans for 20 former Shell OCS leases off Camden Bay, in the Eastern Beaufort. The US Bureau of Safety and Environmental Enforcement approved the transfer of Shell’s leases to ASRC April 13. The area is highly prospective and includes Union Oil’s small “Hammerhead” oil discovery made in 1986 and two Shell prospects, Sivulliq and Torpedo, outlined in 2012. A well was partly drilled by Shell at Sivulliq but not completed. It helps to have an economic stake. Over several years Alaska Native-owned development corporations – ASRC isn’t alone – have gradually become dominant players in industry support and service work on the North Slope. Doyon, Ltd., owned by Athabascans of Interior Alaska, owns Doyon Drilling, the largest Alaska drilling contractor on the North Slope. Bristol Bay Native Corp. and Calista Corp., of southwest Alaska have stakes in oil field services and drilling. Even tiny Nuiqsut, an Inupiat village of 300 near the Alpine oil field west of Prudhoe Bay, owns a drilling company. Nuiqut’s Kuukpik Drilling is working this year for ConocoPhillips and also works in Cook Inlet, in south Alaska. ASRC began working in oil field construction on the slope and expanded over several years into a variety of technical service fields. It’s all about owning the resource The big money is in owning the resource, however. It is here that Arctic Slope has played its cards shrewdly. Alaska’s Native corporations were formed in 1971 when the US Congress resolved long-standing land claims that had become an impediment to securing rights-of-way for construction of the Trans Alaska Pipeline System. Congress transferred 45 million acres of Alaska to Native ownership and paid a cash settlement of $962 million to twelve regional Native development corporations that were also formed. It seemed logical for the new Native corporations to invest in businesses and services to the fast-growing Alaska oil industry, and it turned out to be a successful strategy. The initial moves into catering, facilities management and services in the 1970s evolved into drilling and construction. ASRC pursued a similar path in oil field services but also had different cards to play. 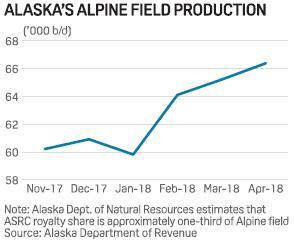 As a landowner on the North Slope, ASRC held part of the mineral rights in the Alpine field and began splitting royalties with the state of Alaska when that field began production in 2000. 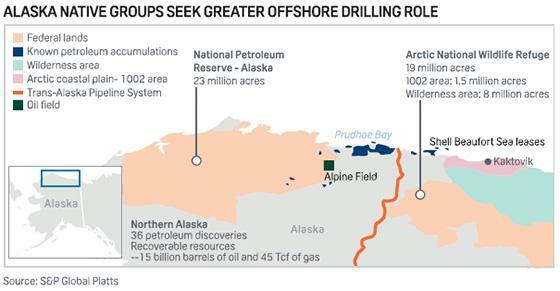 ASRC is now a working interest owner in the small Badami field east of Prudhoe Bay, which is producing, and it has a working interest in Liberty, a small deposit in shallow offshore waters near Prudhoe. The corporation also acquired its own onshore state leases in lease sales and has done exploration drilling on the acreage. 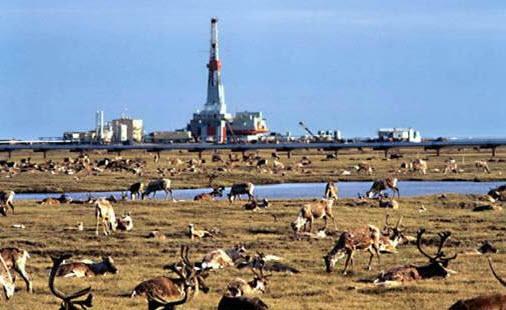 Its biggest coup, however, was in securing mineral rights in a 92,000-acre inholding in the Arctic National Wildlife Refuge’s coastal plain, which is prime real estate after Congress approved exploration in ANWR in the 2017 tax act. ASRC made its move in the 1980s, years before the national spotlight focused on ANWR. The inholding was held by Kaktovik Inupiat Corp., the Native village corporation for Kaktovik. ASRC was able to swap land it owned in areas where the US wanted to preserve parkland for mineral rights under some vilage-owned land in ANWR. The Native corporation went on to do a deal with Chevron and BP to drill an exploration well, KIC No.1. Because no development of the Native-owned land could occur until Congress voted to open the entire coastal plain, the results of that well were held confidential, and have been for decades. Chevron and BP still hold rights under the deal, but the terms are also confidential.